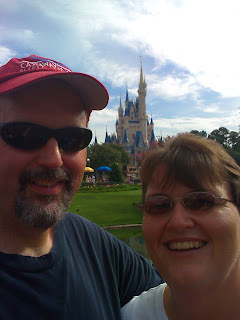 Yesterday Patti and I were able to spend a day at Walt Disney World's Magic Kingdom in Orlando. We had a blast! The other day I was talking to someone who asked me which Magic Kingdom park I liked I liked better, Orlando or Anaheim. I immediately said Disneyland in California, I guess being an annual passholder for Disneyland I am partial to the California park. However, after experiencing both parks in a matter of two weeks, I will have to change my answer. There is no way to compare them, I love them both. There are subtle and major differences in the parks, but mostly similarities. First of all Disneyland due to available space is compacted so things seem closer together. They both have Cinderella's castle as the centerpiece, but there is no comparison there. Disneyland's castle is cute and looks like it was built for a children’s theme park. Disneyworld's looks like a castle. Both use forced perspective to make the observer think that the castle is larger than it actually is, but Disneyworld doesn't rely on it quite as much. Disneyland's castle is 77 feet tall, and Disneyworld's castle is 180 feet tall. Next to the castle in Disneyland is the Matterhorn mountain bobsled roller coaster. It doesn't exist at Disneyworld. 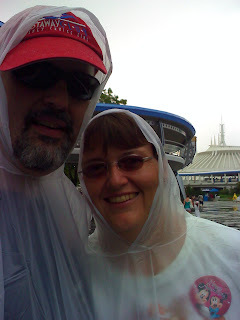 Disneyworld also left out the storybook land boat ride and the Casey Jr. Train. Disneyland has Indiana Jones next to the jungle cruise, which is also not in the Disneyworld park. Disneyland also has resurrected the submarine ride based on the movie "Finding Nemo". Disneyworld does not have this either (currently). There are similarities in some of the classic rides that make you think of all of those Star Trek alternate reality episodes. Both have "Pirates of the Caribbean" but Disneyland's is longer with a few more parts to the ride. Both have "It's a Small World" but Disneyworld's is completely inside. Most of the "Haunted Mansion" is the same (on the inside). "Splash Mountain" is the same pretty much except the logs you ride in are different. The California logs have you sitting in a line of about five one behind the other. The Florida logs have you sitting two per row for three rows. It is more like a boat than a log flume. "Space Mountain" is the same but in reverse. The California rockets have you sitting two per row for three rows. The Florida rockets have you sitting in a line of four one behind the other. The Florida rockets are smaller (lower) but the lapbar arrangement is in a T shape and easier to use. I had no problem getting in. The Trains in the Disneyland Railroad seem smaller too. 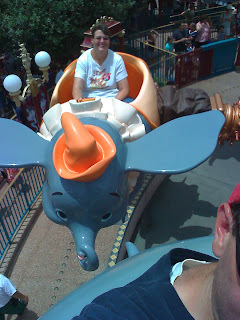 Then there are the things that Disneyland has done away with or never had that Disneyworld holds on to (thank goodness), such as the "Country Bear Jamboree", "The People Mover" (Tomorrowland Transit Authority), "The Carousel of Progress", and Abraham Lincoln. Disneyworld has the "Hall or Presidents" where Disneyland seems to have gotten rid of "Great Moments with Mr. Lincoln". That being said I had a ball in both parks, no more so in either one. One of the reasons I think I preferred Disneyland is across the plaza at California Adventure. California Adventure is a very fun park, it doesn't get as crowded as Disneyland, and I like the option to parkhop without having to ride monorails or shuttles. It's also nice to be in walking distance of my hotel for the same reason. These things have nothing to do with the actual park itself though. When judging them for what they actually are when you walk in the gates, they are exactly what they report to be "The Happiest Place on Earth". I must admit - I wouldn't complain if I were at one park or the other myself! I am glad you guys had a great time - just a little jealous tht I wasn't there! You should have been. One of these days you are going to have to go back to Florida.